Hunter's Irrigation Management & Monitoring Software (IMMS) is a PC-based software package that makes central control of large-scale irrigation systems affordable, usable, and comprehensible. IMMS software and hardware have been intensively developed and refined into a graphically based irrigation command and control program. 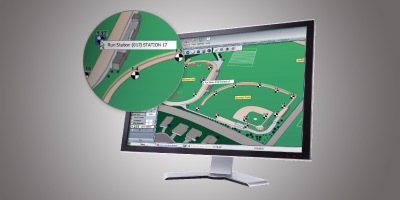 With IMMS, interactive map graphics (to station level) put the irrigation system manager in complete visual control of wide-area watering operations. An optional ET software add-on provides complete weather-based irrigation with station level soil moisture modeling, using inexpensive local ET sensors. IMMS has a full range of communications options, including Ethernet, GPRS mobile, dial-up telephone, UHF radio, and hardwired cable. IMMS is a PC-based application that is compatible with Windows XP through Windows 8. The IMMS graphics update includes the ability to create one or more map views for control purposes. You can see where all of your irrigated locations are, and click any for a more detailed view or control purposes. Ideal for orienting new employees, IMMS Graphics also simplifies life for busy irrigators with large numbers of assets to control. Use any background image to show the system, site, or controller area, and create control zones and station symbols that link to their command functions. You supply the pictures, and IMMS includes all the tools you need to create an interactive map-based system. IMMS can also import CAD linework for truly intelligent custom maps. Each controller has its own complete setup and operations screens with tools to quickly and easily get the results you want. Eliminate the confusion and hassle of multiple field personnel setting up irrigation with dials and buttons. Shut off irrigation with a mouse click for emergencies. Access every function of controllers from simple spreadsheets or choosing from a menu of common functions and commands. Save water the quick and inexpensive way by adding Solar Sync to your controllers. IMMS will report and log all Solar Sync adjustments and alarms, and provides graphical histories of weather adjustments. Take the guesswork out of irrigation amounts and daily adjustments for weather conditions. The optional IMMS-ET software add-on uses cost-effective local sensors, combined with your station database (for plant types, soil, precipitation rate, and more) to create water-saving irrigation programs for your whole system, every day. IMMS-ET models the moisture level in soil reservoirs (including compensation for natural rainfall) and schedules just enough irrigation to replace what your plants need. IMMS-ET can track climate history according to your own sensors and document how it has responded with irrigation adjustments. IMMS reports all alarms, including over-currents, flow violations, communication issues, and water window violations, with individual date- and time-stamped messages. The IMMS operator knows the state of all irrigation controllers and valves at a glance, without driving around town to check individual sites. Printable reports can be exported to other formats or handed to work crews for investigation. Track your water usage, and spot plumbing problems a mile away (or several hundred miles away). IMMS is built around the powerful ACC controller platform, which includes real-time flow monitoring. With a flow meter and normally-closed master valves, the ACC detects incorrect flow conditions and moves swiftly to isolate the offending valves. Each flow violation is reported to the central software, after the controller has finished its own diagnostics. Leaks, breaks, and flooding are minimized, and the irrigation manager is the first to know of any issues. IMMS also tracks total water usage by site, controller, program, and station. Keep detailed historical records, and go home each day with the peace of mind given by automatic flow monitoring. IMMS is optimized for the Hunter ACC controller and accessories (including decoder controllers). Flow-Sync®: Hunter Flow-Sync sensor for ACC controllers (one per controller). Provides flow total reporting and flow alarm monitoring with diagnostic shutdowns in real time. Clik Sensors: Each controller should have its own rain sensor for fast rain shutdowns. All Hunter Clik sensors are compatible with ACC. ET Sensor: ET Sensor platform is for use with IMMS-ET software. ET Sensor is added to selected ACC controllers, to report local conditions. This local ET data has no additional monthly charges and can be shared through the software to create schedules for other controllers in the same micro-climate. Add as many ET Sensors as needed to sample all micro-climates. Solar Sync Sensor (wired or wireless): Each controller requires its own SOLARSYNCSEN or WSS-SEN for smart, water-saving self-adjustment. Solar Sync sensors also provide rain and freeze shutoff functions. Solar Sync compatibility is included with the basic IMMS4CD software. ACC: Communications options are installed inside the ACC controller cabinet. No additional enclosures or power are necessary for these options. Options include radio, hardwire, dial-up, Ethernet, and GPRS mobile communications.